These days, 4.3-inch-diagonal screens are the standard size on dedicated GPS navigation devices; but for some drivers, that size is still too small. In response, most of the top-tier GPS manufacturers have introduced models with bigger screens, anywhere from 4.7 to 5.2 inches. 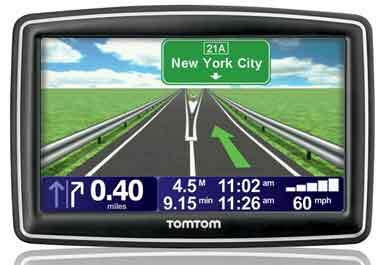 TomTom's XXL 540S has a 5-inch screen. The XXL 540S has the same easy-to-use interface and menu system that virtually all other TomTom products do, but it's easier to see on a bigger screen. Tapping anywhere on the map view takes you to the main menu with two screens of options, including Navigate to, Help me, Change Preferences, Map Corrections, and route/itinerary planning. The XXL 540S supports multisegment routing, so you can plan a trip with multiple intermediate waypoints. The Help me menu gives you options for driving, phoning, or walking to help; provides you with your exact location; and includes a basic first-aid guide. You have a full range of "navigate to" options including addresses, Points of Interests (POI), favorites, home, recent destinations, a point on map, your previous stop, and latitude/longitude coordinates. The XXL 540S includes a generous 7 million POI database that you can search by category or by name. You can specify searches limited to destinations near your location, in a city, or near your home, or (if you have an active route) POIs along your route or near a specified destination. Like most TomTom products, the XXL 540S comes with IQ Routes, which can calculate routes and estimate times of arrival based on historical traffic data rather than on speed limits. For example, a trip from New Jersey to Manhattan takes longer during weekday rush-hour traffic than on a weekend or at midday. The XXL 540S takes such variability into account in generating recommended routes. And even without a live traffic receiver, its travel-time estimates are pretty accurate. The test routes I generated were the ones that I would normally take—a good sign. After devising a route, the XXL 540S provides excellent options including listing directions turn-by-turn, displaying maneuvers as images, showing a route summary, or demonstrating the trip. Initial route calculation for longer trips took somewhat slower than on many competing devices, but recalculation after a missed turn was snappy. Satellite acquisition times, following downloads of quick-fix data, were almost instantaneous. The device's audio feature pronounced street names clearly and at an appropriate level (volume is linked to the vehicle speed). You can customize the status bar on the map view with the data you'd like to see. I updated my review unit to show remaining time, remaining distance, arrival time, vehicle speed, vehicle direction, lane guidance, speed limit, and compass. For a less cluttered screen, you can deselect as many options as you like. The XXL 540S lacks some features (such as a Bluetooth phone interface, a multimedia player, and built-in live traffic) that you might expect on a premium-priced GPS device; TomTom saves those features for its high-end Go series of products. Nevertheless, the XXL 540S is upgradable to live traffic if you buy an optional RDS-TMC traffic receiver for $60; that price includes a year's subscription to traffic data, after which the data costs $60 per year. I plugged in the optional traffic receiver, and the XXL 540S recognized it and immediately started downloading traffic information. On my road tests with the traffic receiver attached, I received notices about delays along my route, but the XXL 540S assured me that I was still on the fastest route. Using the free, downloadable TomTom Home application (available for PC or Mac), you can keep your 540S up-to-date with the latest firmware release, GPS quick-fix data, and community-based map updates, and you can purchase additional voices as well as 12 months of map updates. Map Share technology lets you update road closures, name changes, street direction changes and POIs. You can choose to share your updates with the TomTom community, and you can update your device from the community-supplied data. I've tested and reviewed other TomTom units in the past and liked the company's standard interface. But for me, the 5-inch screen makes the XXL 540S a winner.